Despite the disruptions of three major hurricanes, the underlying economy remains in pretty strong shape. As I outlined earlier this week, a reasonable temporary workaround for industrial production unaffected by the recent hurricanes is to average the 4 regional Fed surveys, minus Dallas, plus the Chicago PMI. Over the long run, each +5 in the average of the indexes is consistent with a +.1 in the manufacturing component of industrial production. Because these indexes have been running "hot" this year compared with industrial production, I further suggested subtracting .3 from the result to be confident in a positive trend. Interestingly, even the Dallas Fed's index was positive, at 19.5! *Since Chicago is on a 0 to 100 scale with 50 being neutral, we subtract 50 from the raw number of 65.2, which gives us 15.2, and then double the result. I am repeating an exercise I undertook in 2012 when Superstorm Sandy disrupted the initial claims data: estimating what the initial jobless claims would have been, but for the hurricanes. In 2012 I created that adjustment by backing out the affected states (NY and NJ) from the non-seasonally adjusted data. That gave me the number of initial claims filed in the other 48 states. I compared that with the same metric one year earlier, and multiplied by the seasonal adjustment. That gave me the number if the affected states had the same relative number of claims during the given week, as all of the unaffected states. In 2012, it showed that Sandy was not masking any underlying weakness in the economy. I backed out Texas starting 2 weeks ago, and also Florida beginning last week. The state by state data is released with a one week delay. So what follows is the analysis for the week of September 16, the number for which was reported at 259,000 one week ago and revised upward today to 260,000. In 2016 the weekly seasonal adjustment was 1.23. This year it was 1.22 Multiplying the non-seasonally adjusted total of 193,546 by 1.23 gives us 238,000. Multiplying by 1.22 gives us 236,000. Thus the hurricane-adjusted initial jobless claims number for the week of September 16, 2017 is 237,000. The previous adjustment for Sept. 2 was 239,000. The average of the three hurricane adjusted weeks so far is 235,000. The underlying national trend in initial jobless claims remains very positive. Given that monetary policy affects economic activity and inflation with a substantial lag, it would be imprudent to keep monetary policy on hold until inflation is back to 2 percent,” Ms. Yellen told the National Association for Business Economics . Let me just remind you one more time that in the past 50 years, during recessions the inflation rate has typically fallen by more than 2%. That means that if the Fed is "successful," the next recession will tip over into outright deflation, including deflation in even nominal wages. Now imagine a wage-price deflationary spiral beginning with Donald Trump as president and the GOP in control of both houses of Congress. As promised yesterday, I put together the graphs and charts to show you that, even when we take out Florida and Texas, new home sales have still turned down slightly since their last peak in March. The trend in prices is still slightly -- very slightly -- higher. I'll have a detailed post up tomorrow, but the takeaway from this morning's report on new home sales is that, even when we delete the hurricane-affected South, new home sales cotninue to be down from their March peak. Further, median prices in August actually turned negative YoY. It appears that the lack of affordability may finally be having a significant effect on the market. Note that even though lack of affordability probably is what mainly causes sales downturns, typically the sales downturn shows up first before sellers get the message and begin to lower prices. More tomorrow, with graph-y and chart-y goodness. Last week I mentioned that the regional Fed surveys plus the Chicago PMI can be used as a workaround to account for the effects of hurricanes on Industrial Production. It isn't pretty and by no means is it perfect, but for the (hopefully only) two or three months that we need it, we can use the workaround to give us the underlying trend in production, particularly for manufacturing. This is a two-step correlation. While the correlation isn't perfect, most notably in the years 2010 and 2011, when the regional Fed average was high, and in 2015 and 2016, when it was too low, in general it holds, with the two rising or falling between positive and negative in tandem, even if we just use the Empire State and Philly indexes. Again this is a pretty good correlation, even if the ISM manufacturing index was much higher than production in 2004, and somewhat higher generally since 2013. Unfortunately FRED doesn't publish the regional Fed indexes, so I can't show you a direct graphic comparison, but what I can do is give you a quarterly sampling of the monthly average of each going back to the "shallow industrial recession" of 2015. To do this I am averaging the Empire State, Philly, Richmond, and Kansas City indexes, along with the Chicago PMI. Since Chicago uses a different scale (where 50 is "neutral"), to include that I subtract 50 and then double the result. I omit the Dallas index, since that includes the Houston area. Florida is in the Atlanta Fed district, which doesn't have a manufacturing index. 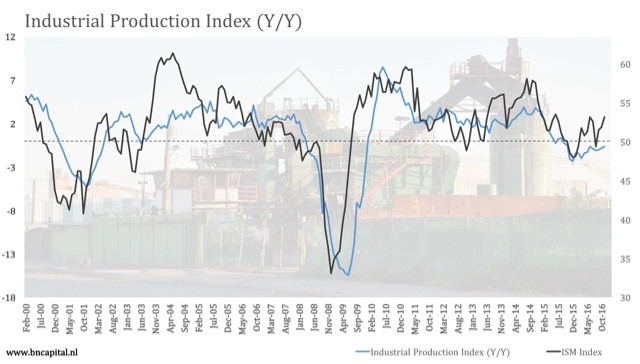 With the exception of March, which was greatly affected by a positive Richmond Fed outlier, the regional Fed indexes caught the rising trend in manufacturing from negative to positive, and especially positive at the end of the year. While this is nowhere near a 1:1 correlation, as I said at the outset this is good enough to communicate the overall trend for the next several months until the hurricane effects recede. 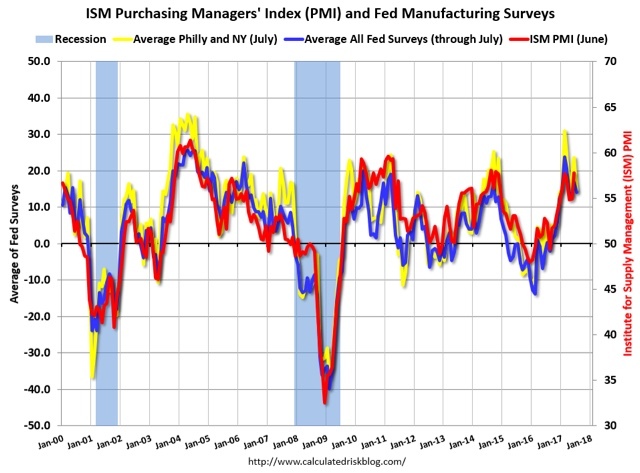 Since both the Regional Fed indexes and the ISM manufacturing index have somewhat outperformed Industrial Production this year, to be confident that a positive average of regional Fed indexes translates into a positive hurricane-adjusted industrial production report, we probably want to see a reading of at least +.3. Even doing so, for August -- and so far in September -- the underlying trend remains positive. A thought for Sunday: the most important issue in the 2016 election was . . . This is a post I've been meaning to write for several months. For a while after the election last year, there was a debate about whether the "economic anxiety" in the (white) working class was the most important factor vs. was it simply a matter of racism. The consensus has nearly settled on the narrative that racism was decisive, to the point where "economic anxiety" has become a taunt, and some who embrace identity politics actively disparage progressive economic issues. I'm here to show you data that - in part - disputes that consensus. What was the most important issue in the 2016 presidential election? The below data on that issue all comes from the Voter Study Group, from its survey published several months ago: "Insights from the 2016 Voter survey." I'll give away one finding right away. The most decisive factor, shown at the right of the lowermost column, is party affiliation. D's voted for Clinton. R's voted for Trump. That's right. The single most decisive factor in the 2016 vote was how people felt about the economy. How can that be true? After all, haven't we all heard that racism was dispositive? The clue is in the difference in slope between the red and gray lines. Even though the economy was the single most important issue in 2016, it was relatively *less* important than it was in 2012. Graphically it was less vertical in 2016 than 2012. And the difference disfavored democrats. 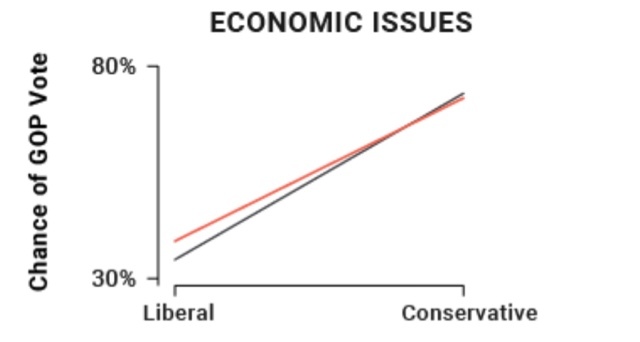 The economy was equally dispositive for conservatives, but less dispositive for liberals. Put another way, economic progressives voted less in lock-step on the economy in 2016 than they did in 2012. And where did those votes go in 2016? The three issues in the top column, and especially the issue at the top left. 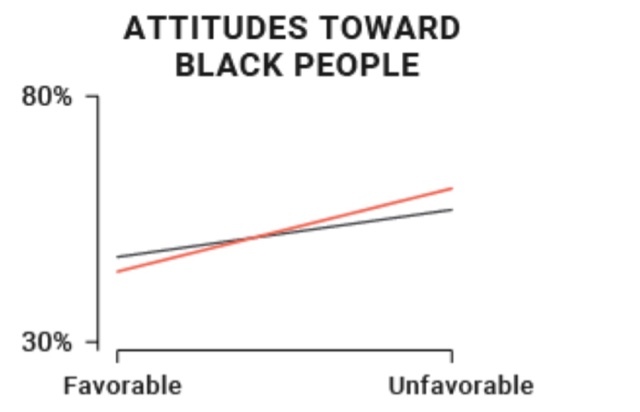 attitudes towards black people. There more than anywhere is your racism, and while the issue did drive progressive voters to Clinton, it drove even more racist voters to Trump. This is an unfortunate dynamic for the left. What it appears to mean is, both progressives and conservatives were motivated by the "Black Lives Matter" movement and protests against police violence. But while the protests may have convinced some progressives, they drove EVEN MORE CONSERVATIVES to harden, and act on, their racial views. In other words, in electoral terms the protest movement was actually COUNTERproductive. attitudes towards immigration. Note that, it too motivated both progressives and conservatives, and it too was more decisive in voting behavior on the right than on the left. To get to the heart of the matter, it wasn't racism per se which drove the electoral college victory to Trump. It was Xenophobia, and anger in particular directed at illegal aliens. While probably about half of the Muslim immigrants to the US come from countries in the Middle East and are white, many also are from places like south Asia and are not white. Yet feelings about Muslims barely moved the needle. 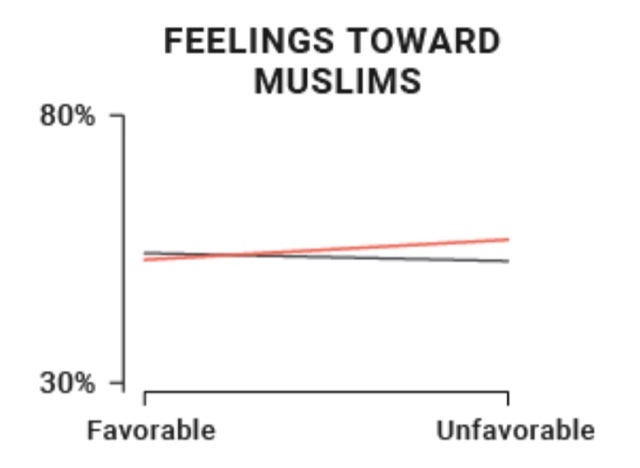 Further, if it were racism per se which was most dispositive, we would expect to see a bigger correlation with feelings towards black people than feelings towards immigrants. Not only was that not the case, but the *reverse* was true. I also found evidence consistent with the "racial threat" hypothesis. As shown by the orange dotted line in the graph, Trump’s vote was higher in counties where the number of Latinos has increased significantly since 2000. This suggests that some voters may have supported Trump as a way of expressing white identity in an increasingly diverse nation. 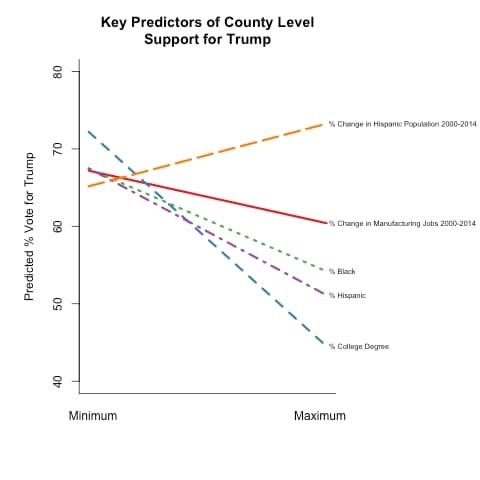 ... Trump also did better in counties experiencing a loss in manufacturing since 2000. At the height of the tech boom in 1999, male Latino unemployment was 1.3% higher than that of white males. In 2006 and again in June of this year, it was only 0.1% higher. Since roughly 11 million, or 1/4 of the total Latino population, are illegals/undocumented workers, it is not difficult to imagine whites (and maybe some blacks) seething that illegals have taken some of their jobs, in a very long and still-incomplete recovery. Is that "economic anxiety" or racism or Xenophobia, or both? And by the way, a similar dynamic about the volume and nature of immigation, by the way, appears to be behind the big decline in the center left Social Democratic parties of Europe. Further, I wish I had kept the cite, but I recall reading stories of white working class voters who went to Trump rallies and participated in all of the chants, who supported him in part because they didn't take his racial rhetoric seriously. They treated it as all part of the show. The distinction is worth emphasizing -- if I am a minority, I may not like a person who is willing to overlook that racial rhetoric, but it is different from a person who actually *agrees with* that racial rhetoric. More succinctly, if it comes down to whether you win or lose political power, you may be dead set against compromising with the latter, but what about the former? Even if you want to embrace the importance of social issues, you simply cannot ignore the economy, which remains the single most important issue to most voters. As I have pointed out a number of times, econometric models did a very good job in 2016 forecasting a narrow popular vote advantage for the incumbent party. Social issues should not be highlighted in ways which drive your supporters to the polls, but drive your opponents to the polls even more. While I unequivocally support a path to legalization, and ultimately citizenship, for DREAMers, it is crystal clear from the experiences in both the US an d Europe that progressive parties have to come to grips with reasonable restrictions on immigration, and enforcement of, immigration laws.